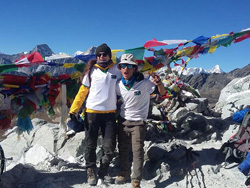 Everest Three Pass Trek | Everest Three Pass Trek Cost 1350 $ | Itinerary | Unique Nepal Adventure Treks & Expedition Pvt. Ltd.
Everest Three Pass Trek Kongma La (5535 m), Cho La (5430 m) and Renjo La (5345 m) are adventure high passes trekking in Everest region of Nepal. When Sir Edmund Hillary and Tenzing Norgay set off on their heroic journey in 1953, this region became famous for trekking and climbing the peaks. Mount Everest “SAGARMATHA” (in Nepali language) at 8848 m is the main attraction because of world highest peak. 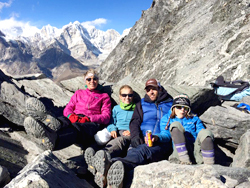 Lhotse 8516 m, Cho-Oyu 8201m, Makalu 8463 m, Ama Dablam 6812 m are also attractions mountains. It is also identified as the home of the Sherpa people and the mysterious Yeti. This trek comprises not only Everest Base Camp but also Namche Bazaar, Lukla, Tengboche and the valley of the Solukhumbu. It boasts the world’s highest Buddhist monastery in Tengboche 3860 m. The trek to the Khumbu area is not only famous for trekking and expeditions, but also for the Sherpa culture. You can enjoy and learn Sherpa culture very closely by visiting this region. The complete trek starts from Jiri to Lukla. Flying to Lukla is the best option for those with limited time. The Everest three pass trekking is one of the most thrilling adventure treks for excitement-seekers. There are several trekking routes within the Khumbu Region like Kalapatthar, Gokyo Lake, Everest Base Camp. The trekking trail is when passing the highest pass must walk in glacier part but easy and comfort track. More than a hundred thousand trekkers visit this region every year. 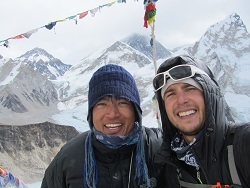 Everest Three Pass Trek is above 5000m complete all Everest region including everest base camp and Gokyo valley. Then, after first pass visit to Everest base camp (5364 m), biggest Khumbu glacier and Kalapatthar (5545m) to watch spectacular close Mt Everest view. We then second pass Cho La (5430m) visit to Gokyo Lake and Gokyo Ri (5480 m) and then climb over the last pass Renjo La (5345m). From these high passes can see four spectacular peaks above 8000m and many more below 8000m. When you success the three pass; of course you will feel miraculous adventure did. After doing three passes Kongma La pass, Cho La Pass and Renjo La you will feel so adventure trekker as yourself. You will see brilliant Mt. Everest view from Kalapatthar (5545 m), and Gokyo Ri (5480 m) and gorgeous view of Gokyo Lake and longest Khumbu and Ngozumpa glacier. After last third pass track will downward along traditional village Thame (3870m) join in Namche Bazaar. Then trek continue downwards to Lukla and fly back to Kathmandu. 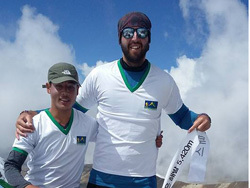 Do it in lifetime and feel adventure trekker. We customize perfect itinerary as you required in regional price provides first-class services. Fell free we always share you reality information as you required. What kind of people, cultures, languages religion can see in Everest Three Pass Trek? Everest region mainly people are living mostly Sherpa people, they have own cultures and tradition, own languages, typical dress up and Buddhist religion. they have own culture and custom most of the part of Nepal we can’t see own typical lifestyle means following modernization but in Everest region they they are conservative their own culture. They have typical festival, when special occasion as marry ceremony or die they do own culturally. They are mostly Buddhism and there is many monastery one example is in Tengboche Monastery one of the best where is best trekking camp. It makes really kind of feeling how to being Sherpa are united and they are not only stronger for mountaineer they have very good majority and culture and community as well. Carry your important medicine: Medicine is very important if you have any disease you must carry the medicine with you. I mean “prevention is better than care” mountain region we can’t find any health care, clinic, and hospital if there is clinic you may not get according to your problem medicine. So, I humble request please prepare if you are continually taking the any medicine please. It is very important but our company will provide something first aid kit bag normally as headache, fever, stomach problem as diarrhea, cough & cool some bandage, tape & Diamox for high altitude sickness etc. 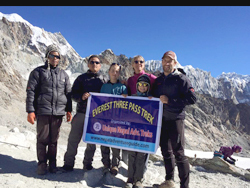 Everest Three Pass Trek Perfect Itinerary And Cost Detail Is US $ 1350 Per Person Should Be Minimum 2 Person. One Person Cost Would Be Bit More. Day 01: Early morning flight to Lukla (2820m) then trek to Phakding (2640m) walking (4-5 hrs) stay overnight at lodge. Day 02: Trek to Namche Bazaar (3440m) walking (6 hrs) stay overnight at lodge. Day 03: Acclimatization day. Visit Everest View Hotel or (Khumjung / Khunde) valley or around National Park Museum then back to Namche. Stay overnight at the same lodge. Day 04: Trek to Tengboche (3860 m) walking (6 hrs) stay overnight at lodge. Day 05: Trek to Dingboche (4410m) walking (7 hrs) stay overnight at lodge. Day 06: Acclimatization day excursion and climb up Narsyang top (4967 m) walking (4 hrs up and 2 hrs down) stay overnight at the same lodge in Dingboche. Day 07: Trek to Chhukung (4730 m) walking (5 hrs) stay overnight at lodge. Day 08: Early morning climb Kongma La pass (5535 m) and trek to Lobuche (4970m) walking (8-9 hrs) stay overnight at lodge. Day 09: Trek to Gorak Shep (5165m) walking (3 hrs) and after lunch visit Everest Base Camp (5364 m) (walking up down around (4 hrs) and stay overnight at nice lodge. Day 10: Early morning climb Kalapatthar (5545m) taking about two hours to ascend and an hour to descend. After having breakfast trek to Dzongla (4830m) walking (4 hrs) stay overnight lodge. Day 11: Early morning climb the Cho La Pass (5330m) (3 hrs) and trek to Thangna (4700m) walking (8 hrs) stay overnight at lodge. Day 12: Trek to Gokyo (4760 m) walking (3hrs) after lunch we can explore around Gokyo Lake and Glacier. Stay overnight at lodge. Day 13: Early morning climb Gokyo Ri (5360 m) taking about two and half hours to ascend and an hour to descend. Stay overnight at the same lodge in Gokyo. Day 14: Early morning climb Renjo La pass (5360m) walking (4 hrs) then descend to Lunde or Marulung (4300m) walking (7-8 hrs) stay overnight at lodge. Day 15: Trek to Namche Bazar (3440 m) walking (6/7 hrs) stay overnight at nice Lodge. Day 16: Trek to Lukla (2820m) walking (6/7 hrs) stay overnight at lodge. Day 17: Early morning fly back to Kathmandu (35 minutes) and transfer to your selected hotel in Kathmandu. All expenses for guide and porters – meals, accommodation, salary, equipment, insurance, transportation etc. Government and local area taxes where is applicable. Some Snaks as Biscuits nuts etc. Nepalese entry visa fee till 15 days minimum 25$ and till 30 days 40$ and easy to issue your visa when you land in Kathmandu Nepal airport. Travel Insurance Do best insurance in case any problem need recover. Hotel in Kathmandu yourself but if you need my help to book. I do book any categories Hotel according to your choices required. Tips to Guide and Donation personal expenses.